The race of Kriar are one of the oldest cultures known to the Ring Realms, super-advanced in technology, and possessing a highly evolved society. The Kriar are not indigenous to Eternity but instead hale from a universe several domains seperated. At some point in the far distant past, this race developed technologies sufficiently advanced to enable them to entirely enclose a starsystem and at some point later make that structure not only mobile but capable of interuniversal travel. This achievement was accomplished approximately 1 billion cycles ago. Since that point their culture has, like ancient nomads, wandered the universes. The structure used by the Kriar to move through the universes is called simply Homeworld. Approximately seven hundred million cycles ago, the Kriar race went through a philosophical schism. Sectarian rhetoric reached a pitch such that a culture which had been without war for untold millions of cycles was again embroiled in interracial blodshed. Rather than allow further damage, the sects seperated. Over a process of some thousands of cycles the original Homeworld was partially disassembled and construction of a new second Homeworld was begun. With the resources of an already built stellar construct at their command, the second Homeworld took shape in a matter of decades. 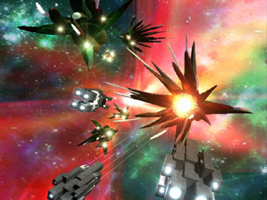 (It is speculated that the original Homeworld took hundreds of thousands of cycles to build.) Two stellar constructs essentially forming from one (like the dividing of a cell). Once the second Homeworld had reached a critical completion point, the two sects of Kriar parted ways—literally going in opposite directions down the chain of universes. The seperatists were known as Dasta Karanganoi, while the original group of universal travellers were called Dasta Fabrista. Interuniversal distances are vast indeed, measured in billions of light centuries. Universes can go through birth and death cycles before the ambient light from neighboring reality pockets ever reaches them. Even with the Kriar's super-advanced technologies, travel between universes took thousands and sometimes tens of thousand of cycles. Large as that span seems, in cosmological terms, these voyages were mere blips. The Kriar moved through hundreds of universes acquiring knowledge, encountering life, and adopting new cultures into the titanic segmented biosphere that exists in the body of Homeworld. If not already arrogant, the leaders of the Fabrista became arrogant in their ongoing search for new knowledge and technologies. Prime Kath Daergon Surr would rise to power and change the course of Kriar history forever. Surr backed the dissolution of the previously adhered to cultural protection "prime-directive". His particular push was to establish the Kriar as a dominant species, in this process actively interacting with and studying other cultures in a non-damaging but socially and psychologically impactful process equivalent to 'tag and release'. Kriar ships would move into a system and request access. 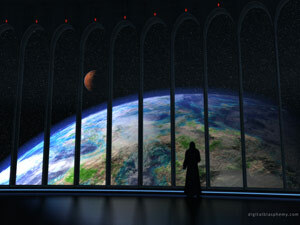 Access not granted resulted in a 'forced' study that involved capture, probing, and release of a significant portion of a planets population, through the Kriar dimensional gating system. (Alien abduction anyone?) The purpose of these studies was to scan for and locate unique ideas, concepts, and lore that could further the currently stagnant Kriar body of scientific and sociological enlightenment. This accelerated "study" of other cultures did yield significant results but at the cost of inflicting severe culture-shock on every race the Kriar came in contact with. This plan was vehemently opposed by many of the ruling heirarchy, but those that resisted ended up meeting with mishaps, or having some other misfortune occur in their lives. It was over this matter that the reigning Kriar matriarch Marna Solaris, and her two confidants and staunch supporters Gwensullin Techstar, and Eladrazelle Delarn left the Kriar ruling counsel. The cycle of study and culture shock continued across several universes until the Kriar encountered the Homeworld of the Jyril approximately four hundred million cycles ago. Not believing there might be an older and more advanced race, Daergon pushed the study when Jyril warned the Kriar not to enter their territory. The push into the Jyril territory immediately resulted in combat losses where there had been none for millennia. The Jyril had craft that not only matched the power and speed of Kriar starvessels, but surpassed them in firepower. Smelling that some really significant technological secrets might be gained from the Jyril, Daergon continued to press the invasion, escalating the conflict into the first war that the Kriar had been involved in since the Fabrista/Karanganoi conflict. The conflict did not last. The Jyril moved enmass and were quick to crush the Kriar vanguard long before it ever got within striking distance of their home planet. It was then the Jyril decided to give the Kriar something to occupy themselves. They inflicted a race-wide "curse" on the Kriar making them not only infertile but unable to feel or experience pleasurable sensations or emotions. This was deemed an appropriate punishment for their "unfeeling" and "insensitive" invasions into the sanctity of other cultures. This loss was devastating to the Kriar in more than the obvious ways. It was a stunning blow to the arrogant and superior attitude carried on by Daergon and his followers. Limping away from Jyril space they retreated to the interuniversal void to lick their wounds, analyze the lessons learned, and try to undo the damage done to their race by the Jyril. The Kriar researchers were soon to discover that the Jyril curse went beyond even their eons old super science. The genetic infertility and "numbing" could not be engineered away, even when manipulating the genes at the atomic level. Somehow, inexplicably, the cells would revert. No detectible radiation or change other than those wrought by the Jyril magic could be discerned. This set most of the leadership into a panic. The Kriar had given rise to their last generation and they as a race would have no more progeny. The only continuance the Kriar would have lay in the then living individuals. A continuance project immediately ensued, and all living Kriar went through engineering to effectively make their lives "perpetual". A renewal procedure was scheduled for all members so that psychotic ennui would not set in from over-long lives. At the time, there were already members from the second generation of Kriar who were already involved in a "perpetual life" program so it came as no shock to the general population when this course of action was chosen as a intermediate solution to the infertility conundrum. The Jyril curse became a new and powerful motivation in the lives of the Kriar. The resources of an entire race were now focused on discovering a means to defeat this disasterous attack. Plans to revisit an attack on the Jyril were immediately dismissed because it was deemed that there simply was too big a gap in the capacities of the two races, and any losses experienced would be permanent and unreplaceable. It was decided that the search for lore to rectify their problem would be sought in other universes. As one would hope, the ruling body had learned something from its mistakes, and was careful with the initial forays seeking information that might lead to a solution. The next cultural contacts were cautious and resulted in a minimum of disruption. An thus was begun "the great seeking". Agents of the Fabrista Homeworld scoured civilization after civilization looking for the choice bit of knowledge that would give them the key that would unlock the Jyril curse. With prime-directive protections back enforce the process was painfully slow and research stretched into decades, centuries, and millennia. Several hundred thousand fruitless cycles had passed when the Kriar found themselves entering a new universe. The universe of the Ring Realms. The followers of the still ruling Daergon decided that the process to discover the solution needed to be stepped up. The Kriar people were growing tired of life even with renewal. A decision was made to again abandon the prime-directive protections. With this new universe the Kriar soon discovered that they had their hands full. Not one but several races possessed not only the ability to resist, but the ability to inflict serious harm. There were the vicious and brutal Lokori whose immense strength and natural time-related psionic powers took many Kriar lives. There too were the Dreel and the Toroth who staged devastating invasions into Kriar outposts and even managed to get war parties in the soft belly of the Kriar homeworld. The Kriar defense forces trained harder, developed stronger weapons, and continued to press deeper into this new and extremely dangerous universal envelope. As they gained a toehold on the some of the richest core worlds they began constructing the gate system to allow better movement and study within the confines of Eternity. It was the activation of the gates and the scanning of the timestreams that were to prove fateful to the Kriar hierarchy. With their roots buried deep in the etheral flesh of eternity, the gates were seen as a threat by the time guardians. The eternals were dispatched to order the deactivation and dismantling of the Kriar portal system. The meeting with the arrogant Daergon did not go over well, and Koass promised that any further incursion would be deemed an act of war. A line was drawn in the sand and Daergon Surr was warned not to step across it. Daergon and his followers dismissed the warning of the eternals. After all there were only twelve eternals. What kind of threat could such a small force pose? The Kriar learned to their dismay that Koass and his followers could do a lot, and thus began the war with the eternals. No quarter was asked and none was given. Ship after ship was destroyed, often being brought down by only one of these curiously powerful creatures. Kriar were dying, and there was no hope for their replacement. Soon the Daergons realized that they needed to change their tactics. They needed a weapon to match the power of the eternals. 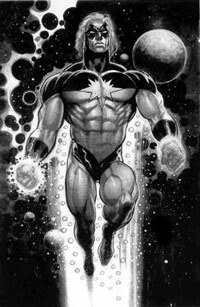 Thus they engineered the creature Garfang, essentially a super-kriar with immense chronal, physical, and psionic power that drew upon the same sources of energy that the eternals did. With the future of their race at stake and smelling a possible solution to the Jyril problem, Daergon personally oversaw the Garfang project. 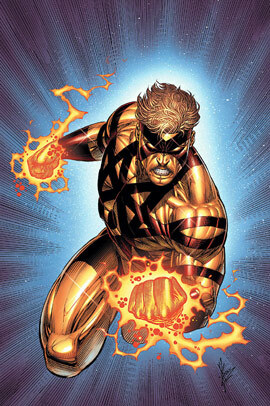 He created a plan by which he could strike down all of the eternals in a single blow using their new secret weapon. Garfang was installed at Kriar waypoint deep in the heart of eternal controlled space along with a battalion of the Shrike legion elite. Garfang was trained and prepared for the battle to come. Unbeknownst to Daergon, Garfang was far more self-willed than even the scientists who designed him knew. The powerful creature discovered what was planned for it after it had fulfilled its purpose. Garfang then developed plans of his own. Daergon's plan proceeded. He mobilized a significant number of his forces to the waypoint to create a "final strike" opportunity for the eternals, hoping it would lure them in with the intent to cripple the Kriar's offensive capabilities. The ploy worked and the eternals' entire force arrived to strike a single retributive blow against the Kriar contingent. Summoning their energies, Koass led the coven of eternals in a ritual to create a single devastating blast that would destroy the entire waypoint, all of the ships, and the Kriar within them. As the eternals prepared their attack, Garfang was deployed. However, the living weapon did not attack as had been originally planned. 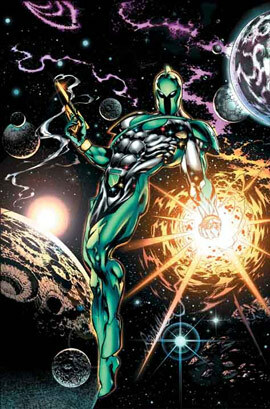 To the Kriar's dismay, he instead waited until the eternals began the attack before taking action. Using his immense powers, he turned their energies back against them, striking through time and dimensional space before they could react. In heartbeats, the defenses of the eternals were crumbling and the mass attack was on the verge of failing. The eternals gritted the attack out, thinking that their energies could overwhelm Garfang. The push grew, the summed powers of eternity growing in a devastating ball of energy, shoved this way and that between the coven of eternals and Garfang. Slowly, their attack was shoved back by the technically born powers of this super creature as he fed on more and more of their power. It was a fierce battle and the first one who blinked would be vaporized, and it was one of the lesser eternals, Yi Esperantil, who flinched. The balance of the coven shuddered and in a sudden flash the energy they had been directing against Garfang washed over them in a devastating and lethal wave. Detached from the coven, Yi herself escaped but the rest of her comrade eternals were destroyed. As this was happening, Garfang allowed the remainder of the eternal attack to pass him unimpeded. In an instant, the waypoint screens were shattered, and the massive strike rained home destroying the Shrike Legion elite and the other forces stationed at the waypoint. After the assault was over, Garfang disappeared, and the Kriar mourned their Pyrrhic victory. The incredible loss was simply too much to bear, and the ruling Daergonians were summarily dismissed for the massive blunder that had resulted in so much unredeemable death. The main contingent of Homeworld retreated back into interuniversal space to recoup and rethink its follies. Hundreds of millennia later a mage by the name of Cassandra Kel'Ishtauri [Profile] would find and don a set of Kriar power matrixes once belonging to a certain notorious Kriar leader, and set him loose in the boundaries of eternity to wreak havoc. 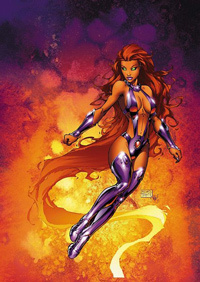 Through her contact with him she would eventually make contact with Ivral Techstar [Profile], the daughter of Gwensullin Techstar who would summon back the Kriar Homeworld. This famous mage would eventually assemble the pieces of the shaladen amulet (the amulet of Tarkimar) used by Koass Vinax to bind the eternals into a coven, and restore the shattered paradise stone that served as the key to all of the energies of eternity's heart. 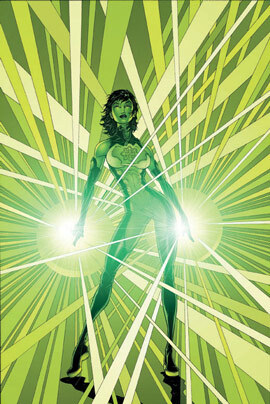 She would gain the powers of eternity and eventually begin restoring the bodies of the eternals. Thereafter, she would enact the most significant change in Kriar history. The lifting of the Jyril curse. Currently, the Kriar having recently regained their ability to reproduce, are understandably shy of venturing into further universes. Their biggest desire now is to settle down apart from Homeworld and start again with family cycles. This has been met with considerable resistance by such leaders as Aarlen Frielos and Vulcindra Skybane who see, and understandably so, the super-technical race as a threat. The Kriar and their Matriarch, Marna Solaris in particular are actively pursuing a good-will campaign to revitalize their previously ugly and beligerent image. 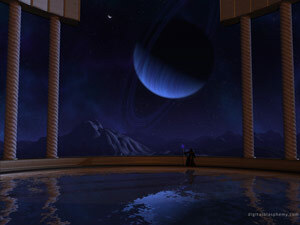 To that end, the Kriar military has begun open cooperation with the Protectorate, helping guard the precincts of time. Perhaps as an extension of Kriar goodwill (and the Kriar's sudden fascination with humans after Cassandra removed the Jyril curse) many Kriar / human liasons have cropped up. The high Vatraena herself has taken on a paramour (Dominique Ariok). The Techstar family formally adopted Cassandra Kel'Ishtauri and her family. Belkirin Dulcere, the daughter of the Counsel Solaris, a recently recovered war victim, has been reported amongst the Protectorate keeping apparently intimate company. 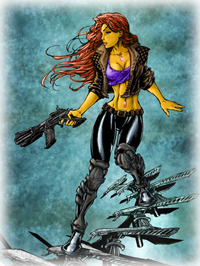 Quasar Diliaysus and Eclipse Shargris the renowned Kriar soldiers have also been seen consorting with humans. Little was known of the fate of the Karanganoi until an interuniversal shuttle containing some escaped Karanganoi military personnel were discovered deep in the interuniversal void while a group of Protectorate members were investigating the origins of the Jyril. Two female Baronian war mages named Alloy and Luthice had helped the Kriar engineers to escape. 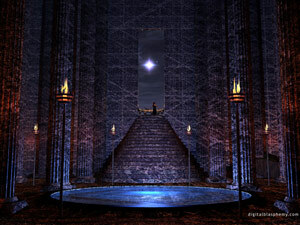 The team learned that the Karanganoi had encountered another universe occupied by Jyril. Only, this sect of Jyril weren't nearly as nice as the ones that merely sterilized the Fabrista. A servitor race known as the Baronians were unleashed on the Karanganoi Homeworld by the millions. Though the Karanganoi had not lost their fertility like the Fabrista they were still not populous. The largely peaceful and academic Kriar were overwhelmed by shear numbers and the viciousness of the assault. The ruling Karanganoi managed to get their Homeworld underway away from the Jyril universe, but the effort was too little too late. The Baronians, strong in both magic and technology systematically crushed the Kriar resistance. Having already moved far out of the reach of the Jyril universe, the Baronian magic functioned at only a tiny fraction of its former strength. So, magical means of scrying and divining were denied to the invaders. Thus began the long cold war between the Baronian invaders and the sparse number of surviving Kriar warriors and engineers. After a few thousand cycles and the assistance of some female Baronian dissidents, a few Kriar managed to steal a ship and go in search of assistance to free the Karanganoi from occupation and enslavement. Hearing this story, Counsel Solaris decided that the Baronians should never be allowed to gain full command of the Karanganoi Homeworld. A special team was assembled and unique weapons and devices for the assault were developed. Leveraging her recent alliances with the Protectorate, Marna struck a deal with the Shael Dal to help her shut down the now rogue Kriar technology. The team would go to Karanganoi world-sphere and remove the cybercore and prevent the Baronians from ever gaining full control of the gigantic vessel. She reasoned that it was in the Protectorate's best interest to assist in this endeavor. The intelligence given to her by the escaped Engineers indicated that the Baronians were readying to abandon the out of control vessel and would migrate to the nearest universe they passed. The nearest universe would be Eternity, and unless the Baronians were stopped they would become the Protectorate's problem. They could be dealt a preemptive blow, or the Protectorate could wait until a full scale Baronian migration ensued. The decision to go ahead was granted. The team still had many cycles before Karanganoi Homeworld was close enough to truly be a worry. In order to be successful, the strike team would need a huge advantage over the long entrenched Baronians. According to the Kriar engineers, the Baronians had managed to adapt their magic to work to some degree in the inter-universal space. Something Marnas team members would not have time to figure out. In order to fight the Baronians on their own terms they would have to develop a kind of magic "battery" that would allow the mages of the strike team to continue to function in the primordial reality outside of Eternity. The solution was not forthcoming, and most of the mages of the Realms refused to help the Kriar discover a solution—this largely in part due to a boycott staged by Elsbeth Crowninshield who feared the corruption of Eternity's magic by the Kriar. Counsel Solaris, now close to some elder mages, knew what would make researchers cross the pickett line of Elsbeth's boycott. The wiley Kriar leader held a contest. The prize, the collected magical knowledges acquired from Eternity, and all the other universes the Kriar had encountered over the eons. This knowledge would be given to the research team that came up with solutions to the various problems faced by the Karanganoi strike team. With a billion lifetimes of indexed accumulated knowledge up for grabs, there was a veritable stampede of applicants suddenly willing to risk Elsbeth's wrath. The Kriar set up a safe haven deep in the heart of Homeworld and made available the entirety of their vast accumulated knowledge for use by the mages of Eternity willing to work on the problem. After word of the research materials being made available to applicants got out, even Mother Isis the goddess of magic began seeking technically savvy research partners to assist in the acquisition of the prize. Thus began magic unraveling campaign. With several research teams vying to be the first to figue out how to make magic and even the powers of the Shaladen swords operate outside the influence of Eternity. From the outside, Elsbeth Crowninshield railed against the 'traitors' holed up inside of Homeworld, diligently giving away the secrets of magic to their golden hosts. Even the goddess of magic had sold out! Two cycles later the team of X and Y emerged victorius, having created a magical antenna that could use Kriar matrix stones as a power source and create an artificial envelope of Eternity's energies and rule systems, allowing magic to work normally with in it's limited confines. Further, they had created magic "batteries" that could maintain a mage's memorized spells when they went outside of Eternity. The team underwent a journey of several months and encountered stiff resistance on Karanganoi Homeworld. In their infiltration of the Baronian defenses, Tal Falor made contact with the female Baronian insurgents. In return for critical information necessary to the mission, Tal promised to get the twelve female Baronians off Karanganoi homeworld and into a place of safe haven. In a seperate mission weeks later, Tal did keep his promise. With the determined members of the Shael Dal cooperating with the determined Fabrista Kriar, the team eventually won their way through and disabling the Karanganoi cyber core and preventing the Baronian invaders from gaining further control of the powerful ship. This of course did not free the thousands of Karanganoi imprisoned and under control. With their team so small there really wasn't much they could do. They did free a few of the Kriar military personelle they encountered (Belkirin Laan Stouvros, and Shal'kar Higein Jharth) who took up posts with the Fabrista military as advisors to the "Karanganoi Problem". Karanganoi homeworld remains under Baronian control. While removal of the cyber-core crippled the information systems and disabled navigation it was not a permanent solution. Intelligence reports that the Baronian's have after only a few years of effort managed to Karanganoi homeworld underway again. Unable to change its course or control its speed the stellar-vessel will eventually impact the reality envelope of Eternity in roughly two centuries. The problems with the Karanganoi Baronians are far from over. With each day, they gain greater mastery of Karanganoi technology and have already sent inter-universal shuttles out that have deposited cadres of Baronians in Eternity. It is only a matter of time before they arrive in sufficient strength to create new and bigger troubles for the Fabrista and the other races of the Ring Realms. Characteristics : Dense body tissue. Eyes are genetically engineered to "change" at puberty from a ordinary light-only visual sensor, to a multi-spectrum visual organ (the all black appearance). Kriar being a vegetative (rather than mammalian) humanoid race possess several plant-like attributes. Their skin is photosynthetic, and they derive nourishment from light. Their tissue is dense (like wood) and thus they are heavier and more resistant to injury. Kriar scientists have heavily modified the heriditary physiology of the species and many of the evolutionary drawbacks of their origins have been engineered away. Most Kriar rely on a life-support mechanism called a matrix stone that is embedded in their bodies at a young age. These jewels provide supplemental photosynthetic nourishment so the Kriar can function for extended periods in environments where there is little to no natural sun-light. These jewels are normally installed in sets. A focus stone in the forehead, a distribution matrix enfleshed in the collarbone, and brain-stone or central control enfleshed beneath the lower abdominal muscles. These matrixes often have cybernetic enhancements and convenience mechanisms built into them depending on the kind of work the Kriar does. Warriors typically have additional implants in the palms of both hands. These are high-energy foci. The hand focus allows the warrior to create force weapons and shielding, along with usually having various sensor and cybernetic apparatus built into them.